Super pollutants are one of the most underappreciated but dangerous contributors to climate change. Also known as short-lived climate pollutants, or forcers, super pollutants are potent noncarbon-dioxide global warming contaminants. They are also dangerous for human health and diminish agricultural productivity. Reducing carbon dioxide—the primary greenhouse gas emitted from the burning of fossil fuels for energy and transportation—is necessary for achieving the long-term greenhouse reductions we need. However, it is impossible to achieve the total greenhouse gas reductions scientists agree are necessary for avoiding dangerous temperature increases without also limiting super pollutants. Not only are super pollutants shorter-lived, but they also remain in the atmosphere for a shorter time than carbon dioxide; therefore, reducing these pollutants now can help reduce temperatures in the near term. In addition, the reduction of super climate pollutants can be easier than the reduction of carbon dioxide since none of them, unlike CO2, are a byproduct of our primary sources of energy. Black carbon is the second-largest greenhouse gas after carbon dioxide. It is a major element of soot, which is one of the most deadly forms of widespread air pollution. Soot is linked to heart attacks and strokes, cancer, developmental effects in children, and premature death. Black carbon is produced by the incomplete combustion of fossil fuels, biofuels, and biomass in transportation industries; wildfires and agricultural burning; domestic cooking; natural-gas-fueled power generators; and other industries. Black carbon leads to decreased agricultural productivity because it influences the formation of clouds and disrupts participation patterns, and it rapidly increases the rate of ice melt in the Arctic. Methane is a powerful greenhouse gas that is 20 times more potent than carbon dioxide. Natural gas and petroleum industries are the largest emitters of methane in the United States, accounting for 30 percent of U.S. emissions. Enteric fermentation from livestock accounts for 23 percent of U.S. methane emissions and landfills account for 17 percent. Coal mining and wastewater treatment also contribute to U.S. methane output. Methane contributes to the creation of tropospheric ozone, which can dramatically reduce crop yields. Hydrofluorocarbons, or HFCs, are manufactured for use in refrigeration, air conditioning, insulation, solvents, aerosol, and fire-protection products. They are hundreds to tens of thousands of times more potent than carbon dioxide. Developed and produced as substitutes to ozone-depleting substances (that are being phased out in the Montreal Protocol), these gases are the fastest-growing greenhouse gases across the world. This background brief focuses on three super pollutants that are some of the largest contributors to global warming: methane, black carbon, and HFCs. It explains the sources of these pollutants, their prevalence, and why fast action to reduce them is imperative for protecting public health and avoiding the disastrous impacts of global warming. The best way to understand the comparative global warming effects of super pollutants versus carbon dioxide is to understand their global warming potential, or GWP. GWP is a measure of the relative warming potency of a greenhouse gas over a period of time compared to carbon dioxide. HFCs, for example, have a global warming potential of between 140 and 11,700, meaning they are more than a hundred times and up to tens of thousands of times more potent than carbon dioxide. But even though they are much more powerful than CO2, super pollutants lose their warming power in the atmosphere much faster than CO2. Half of CO2 pollution continues to cause increased temperatures for 50 to 100 years after being emitted, and 20 percent remains for thousands of years. In comparison, black carbon is hundreds to thousands of times more potent than CO2 as a contributor to global warming, yet it leaves the atmosphere in a matter of days or weeks. HFCs only stay in the atmosphere for 15 years on average, yet they can be tens of thousands of times more potent than CO2. 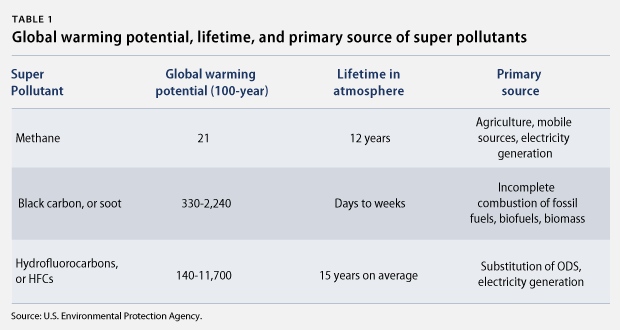 The following table lists the GWP and atmospheric lifetime of the three main super pollutants. Radiative forcing, known as the “greenhouse effect,” occurs when solar radiation that passes through cloud cover reflects off of the Earth’s surface and is absorbed by clouds and greenhouse gases, or GHGs, in the atmosphere. Increased levels of GHGs reradiate upward and downward, warming the surface of the Earth. Why are super pollutants important? Warming is having real and deadly impacts, particularly as a driver of trends in extreme weather. Global average temperatures have already increased more than 0.8 degrees Celsius over the past 100 years, and most of this increase has been a result of human-induced emissions since the industrial revolution. The internationally accepted goal to limit temperature increase caused by humans is to hold the increase to a rise of no more than 2 degrees Celsius, or 3.5 degrees Fahrenheit, over preindustrial levels; scientists agree this is necessary to avoid the worst impacts of global warming. While long-term temperature stabilization is dependent on reductions in CO2, immediate reductions of super pollutants can provide rapid relief from extreme climate-related impacts by creating measurable decreases in temperature in the short term. Even if aggressive actions to cut CO2 were taken tomorrow, they would not have an impact on temperature decrease for many decades. For example, a January 2012 study published in Science by an international team of 24 scientists and led by NASA climate modeler Drew Shindell, estimated the effects of initiating 14 methane and black carbon control measures. Combined with other greenhouse gas reductions, the study concludes that these measures would reduce total projected warming by half a degree, prevent 0.7 million to 4.7 million annual deaths, and increase annual crop yields 35 million to 130 million metric tons due to ozone reductions in 2030 and beyond. According to the study, rapid reduction of other super pollutants, primarily HFCs, could significantly increase these temperature savings. These reductions can be achieved at a relatively low cost. Reducing a metric ton of methane, for instance, costs around $250, while the benefit is worth $700 to $5,000. Black carbon is a component of soot, the common term for PM 2.5 pollution—particulate matter that is 2.5 micrometers in diameter or smaller, which is about 30 times smaller than an average human hair. 52 percent of black carbon emissions are from mobile sources—mainly trucks—and 93 percent of that total is from diesel engines. About 35 percent is due to biomass burning—wildfires, agricultural and prescribed burning, residential heating and cooking, wood-fired boilers, and charbroiling. About 7 percent is emitted from the generation of energy and power, primarily natural gas combustion. 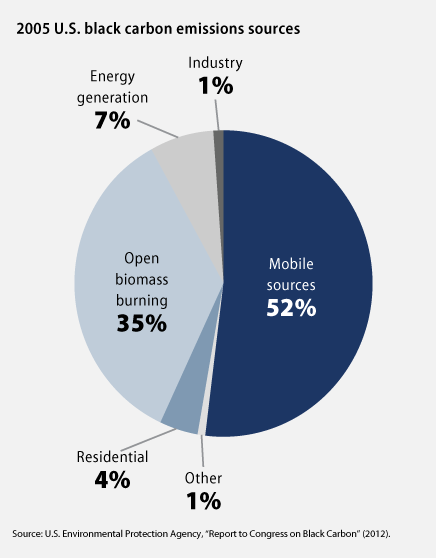 1 percent is from industry, and 3.6 percent comes from residential sources such as woodstoves and furnaces. Soot is one of the deadliest forms of widespread air pollution. Long-term exposure to soot when it enters the lungs and bloodstream is linked to heart attacks, strokes, respiratory problems, cancer, higher incidence of infant mortality and low birth weight, and premature death. Black carbon leads to decreased agricultural productivity because it influences the formation of clouds and disrupts rainfall patterns. 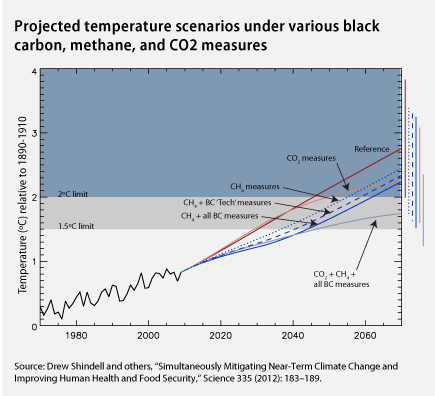 It is estimated that black carbon may be the second-leading contributor to global warming after CO2. Black carbon is also a significant driver of the rapid depletion of year-round ice formations in the Arctic Ocean. Soot deposits on ice reduce the natural albedo effect, whereby the white surface of the arctic ice reflects solar radiation. As a result, those parts of the Arctic Ocean that are polluted the most by black carbon will melt faster. Methane is a greenhouse gas that is 20 times more potent than carbon dioxide, but it only remains in the atmosphere for about 12 years after it is emitted. The United States emitted 587.2 million metric tons of CO2 equivalent of methane in 2011. According to the U.S. Environmental Protection Agency, or EPA, this accounted for approximately 9 percent of U.S. greenhouse gas emissions in 2011. Natural gas and petroleum industries are the largest emitters of methane in the United States, accounting for 30 percent of U.S. emissions. Enteric fermentation from livestock accounts for 23 percent of U.S. methane emissions, and landfills account for 17 percent. 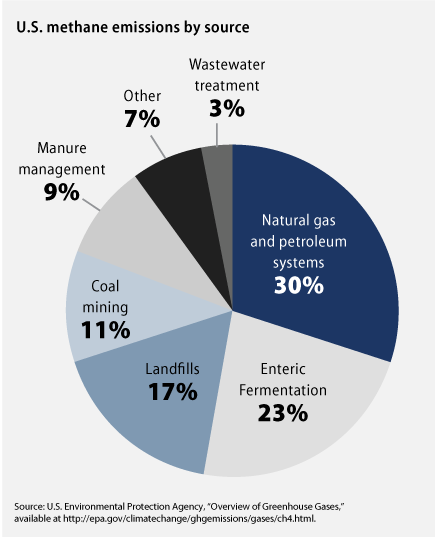 Coal mining, manure management, and wastewater treatment also contribute to U.S. methane output. In addition, methane contributes to the creation of tropospheric ozone, which can dramatically reduce crop yields. Hydrofluorocarbons are greenhouse gases that are hundreds to tens of thousands of times more potent than carbon dioxide. The average atmospheric lifetime for most commercially used HFCs is less than 15 years. HFCs, unlike other super pollutants, are manufactured by humans and not found in nature. They are most commonly produced for refrigeration, air conditioning, insulating foams, solvents, aerosol products, and fire protection. HFCs are the fastest-growing greenhouse gas in the United States and globally. Fluorinated gases, including HFCs, perfluorocarbons, and sulfur hexafluoride, made up 2 percent of U.S. greenhouse gas emissions in 2010. 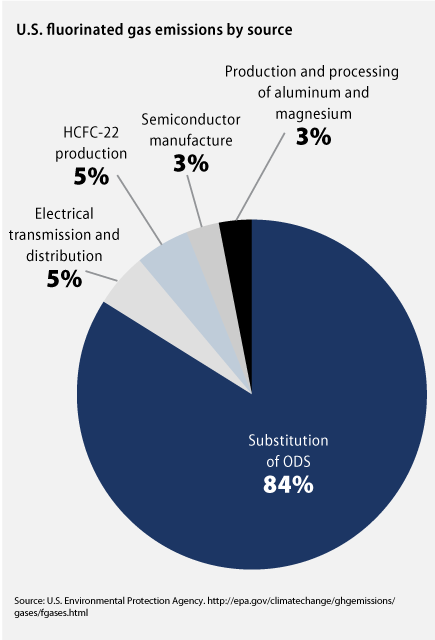 HFCs are projected to grow by nearly 140 percent through 2020 in large part because they are being used as substitutes for ozone-depleting substances, or ODS, that are being phased out under the Montreal Protocol on Substances that Deplete the Ozone Layer. According to the EPA, U.S.-fluorinated gas emissions increased by about 61 percent between 1990 and 2011. The increase was driven by a 249 percent increase in emissions of HFCs since 1990 after they became a common substitute for ozone-depleting substances. By reducing the release of super pollutants, the United States has the opportunity to accomplish the following: quickly decrease global warming pollution; limit temperature increase caused by climate forcers; improve health impacts caused by soot and extreme heat conditions; improve global annual crop yields; and buy some time on passing the 2 degree Celsius threshold. The United States has fortunately been a leader on advancing international agreements to reduce super pollutants. For the past four years, the United States, Mexico, and Canada have proposed a plan to phase down emissions under the Montreal Protocol. In February 2012 the United States helped launch the Climate and Clean Air Coalition to Reduce Short Lived Climate Pollutants, which now includes the European Union and 30 countries that are working together to share the best solutions to reduce these gases. But more international support is needed to advance these efforts. In addition to engaging foreign governments at a leadership level on these measures, the most important thing that the United States can do is to lead by example. 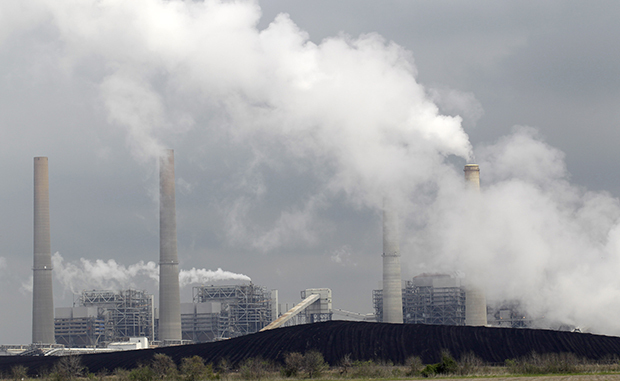 The United States has made some progress in reducing super pollutants. Corporate Average Fuel Economy, or CAFE, standards encourage low global warming potential substitutes for HFCs by allowing car and light truck manufacturers to generate credits toward compliance by using alternative refrigerants for model year 2012–2016 vehicles. There are several voluntary programs in place that allow state and local governments to work with companies and the EPA to reduce methane emissions. Natural Gas STAR, for example, encourages oil and natural gas companies to adopt technologies and practices that reduce methane emissions. As a result of voluntary methane partnership programs, total U.S. methane emissions in 2005 were more than 11 percent lower than emissions in 1990. Advancing domestic initiatives to reduce these gases now could encourage more international cooperation on super pollutants, which would result in a rapid decrease of atmospheric warming and a reduction of the risk of extreme climate impacts. The saved lives and improved agricultural production that results from reducing super pollutants provide ample reason to act now. Rebecca Lefton is a Senior Policy Analyst at the Center for American Progress. Thanks to Andrew Light and Mari Hernandez for their contributions.